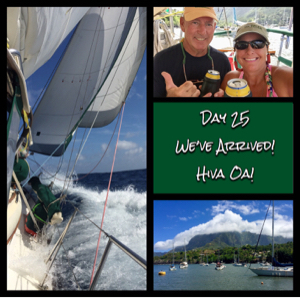 4.19.18 @ 2300 Zulu Day #26….We have reached Hiva Oa! Latitude: 09°48 N Longitude: 139°01 W Distance to the Marquesas: 0 NM…We’re here baby! Distance from Punta de Mita, Mexico: 3027 NM Weather: Freaking Amazing! Sunny and Tropical with a nice breeze! Winds: E 6 Knots Sea State: Bay Swell 1’ Air Temp: 86° Course: Not moving for a few days! Speed: 0 Knots Barometer: 1011 Crew’s Mood: Over the top excited! As I stepped into the cockpit for my final night watch of this portion of our journey I was struck by a long missed but familiar fragrance. It’s sweet with earthy undertones. Yes, it’s the smell of land! We are just 56 NM from the Northeast point of Hiva Oa and 72 NM from the bay. I’m delighted yet somewhat sad that this leg of our journey is nearing its end. Before we left on this journey I had many people ask me questions like “What in the world would posses you to want to get on a boat and spend weeks at sea when you could just hop on a plane and be there within hours?” Well, first let’s discuss air travel these days. It is no longer the luxury form of transportation it once was. These days it is nothing more than a germ filled flying tube full of poorly dressed, poorly behaved, smelly crybabies who whine when they can’t bring their emotional support hamster or peacock on board. Sure, flights are relatively cheap but then you pay $25 per bag to check your luggage, $8 for a cocktail that once was complimentary and let’s not even discuss the overpriced, disgusting, chemical experiment they call food. Yes, it’s true, you get what you pay for! On the other hand there is Dazzler. She’s an amazing and beautiful lady. She’s rugged and stout. She offers premium accommodations, home cooked meals, amazing water views, private, germ free restroom facilities and the company on board can’t be beat. There’s no lines, no pushing, no crying children and no, “I’m sorry, we’re overbooked. Yes we ruined your vacation and lost your luggage but here’s a voucher so your next trip with us is free.” By the way, giving me a free trip when you ruined the last one is like giving me a get out of jail free card after you forced me to spend a year in prison on a bogus charge. Just saying! Okay, okay, enough about air travel. Back to the original question. “Why do this?” Honestly, if a person has to ask why we would do this then most likely they won’t understand anyway. Most likely adventure is not a part of their soul. You can see it in their eyes. It’s the look of confusion as they ask the question. They simply don’t appreciate or embrace the adventure of it. The destination is not what it’s about. It’s the journey that gets you there. It’s doing what man and woman were designed to do….explore! It’s seeing and experiencing things that relatively few privileged people will see and experience. It’s living in the moment and activating all of your senses with the sights, smells, sounds, touch and taste of that which surrounds you. It’s about exploring your inner self, facing fears and rejoicing in simple accomplishments like harnessing 8 knots of wind to get it to pull a 32,000 pound boat through the water at 5 knots. You see, for people who have adventurous souls there really is no “destination” because each new place leads you to the next in your quest to see more and experience more of life. This is who we are and why we do it is really very simple…we want to experience all that life has to offer, not just a tiny morsel of it. Our boat is the vessel that allowed us to take this journey. She performed like an expertly trained athlete. Did she have a few mishaps along the way? Sure, but that is all part of the adventure. You see, the adventure was ALL we experienced along the way. It’s watching mama whales playing with their calves or cheering on a pod of spinner dolphin as they perform an expertly choreographed water ballet. It’s seeing fish fly and birds swim. Its watching the seas as they change from icy blue to aqua green and back again. It’s seeing the sunrise or sunset from a viewpoint that no other in the world is seeing at that very moment because you are the only ones within a few hundred miles. It’s the taste of the salt of the ocean on our lips as we work along side of each other in tense moments trying to fix something that broke and the way we smelled land long before we could even see it. And, 25 days we have dropped anchor in Atuona Bay at Hiva Oa in the Marquesas. The bay is full of cruisers, it’s warm and there’s a nice breeze. We were greeted by Jim and Jeannette of Boo’s Blue who presented us with gifts of French bread, pastries and two Tahitian beers. Our friends on SV Dash, Mike and Kellie, stopped by and Mike even took us to shore for our check in to the country so we didn’t have to fuss with the dink. Our agent from Tahitian Crew, Sandra, greeted us on land and took us to the gendarmerie for our official check in. They spoke little English and we speak little French. Dan presented them with one of his California Highway Patrol patches. They, in turn, tore the patches off of their shirts (velcroed on) and presented them to him. Yep…I was in tears. I already am in love with the Marquesan people. Can’t wait to see what new adventures await us here. So you see, the destination, or should I say, the current destination is now a part of the next leg of our journey. What we are about to experience here will become a part of our souls. The places, the people, the wildlife will all become a part of who we are as adventurers, as people. When we leave here to journey to the next place we will likely feel and think differently than we did when we arrived because we will have a new understanding of new people, their way of life and their customs. And so the adventure will continue and we will be better for it. THIS, is why we spent 25 days at sea when we could have just “hopped on a plane”. P.S. We want to thank you all for following us, sending us your comments and cheering us along when things went sideways. You make all this work worthwhile. Now that we’ve arrived at our destination we plan to take time to enjoy it. For you, our loyal followers, it means we won’t be making a daily post for a while. We’re sure you could use a break from us and our daily rants anyway. We will still be posting but only twice a week. After all, we’re retired and this writing stuff is a lot like work. Ha Ha. Make sure you check back though as we will be posting lots of photos of these magnificent islands and the adventures we experience here. It was an amazing journey! Congrats Dan, Jilly, Grape Ape and Wilson. So who first saw land? It has been a hoot reading your posts. I was looking forward to your daily posts. A few times I felt I was right there with you. I appreciate your insights and true share of your experiences. PS We learned of Dazzler through Pat, my brother-in-law, on s/v Starshine.